Elizabeth Urquhart: The Margaret Thatcher Memorial. Is there really no way of preventing it? Francis Urquhart: It would seem not. It's all been paid for out of the foundation and the site was earmarked 15 years ago, apparently. For a time there seemed some possibility of putting it up in Grantham, where no one would have to look at it. Elizabeth Urquhart: Except the unfortunate inhabitants. Where is Grantham anyway? 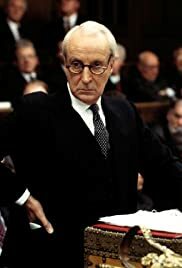 Francis Urquhart: No one seems quite sure.